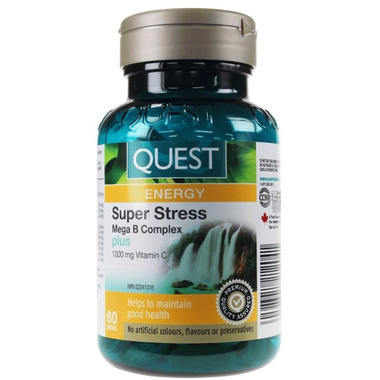 Ingredients: Each easy-to-swallow tablet of Quest Super Stress B + C 1,000 mg contains 1,000 mg of vitamin C (ascorbic acid); 50 mg of each of vitamin B1 (thiamine HCl), vitamin B2 (riboflavin), vitamin B3 (niacinamide), pantothenic acid (d-calcium pantothenate), and vitamin B6 (pyridoxine HCl); 1 mg of folic acid, 50 mcg of vitamin B12, 50 mcg of biotin, 50 mg of choline, and 50 mg of inositol. This product contains no artificial preservatives, colours, or flavours, corn, dairy, gluten, shellfish, soy, sulfites, wheat or animal derivatives. I like this product, and have been taking it for quite a while. Before discovering it I would take B and vita C in separate pills (at the same time) so this is much more convenient! It is also one of the few that meet my dietary requirements (especially soy-free). Overall good quality vitamin, works well. I find that they're a big pill, but manageable. Great vitamin, gives me a boost during the day. I purchased the Super Stress B Complex for myself and after about a week noticed an improvement. I wanted the added Vitamin C as well so this is a great product and price point is also very good.